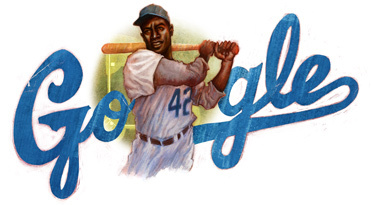 Today is the 94th birthday of Jackie Robinson, the first black Major League Baseball player. He was on the Brooklyn Dodgers and started his career there in 1947. He was instrumental in the civil rights movement and also an outstanding baseball player. To remember him and what he has contributed to American society, Google has a special Google Doodle for his 94th birthday. Robinson was born on January 31, 1919 in Cairo, Georgia and died at the age of 53 on October 24, 1972 in Stamford, Connecticut. His MLB career lasted about ten years, until October 10, 1956. Some of his stats include a batting average of .311, 1,518 hits, 137 home runs, 734 runs batted in and 197 stolen bases with six World Series appearances, six consecutive All-Star Games and a World Series win in 1955. He was also an ABC sports announcer in 1965, the first black person to do that. He was married to Rachel Robinson and they had three children.